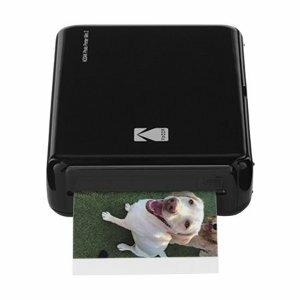 Walmart offers the Kodak Mini 2 HD Wireless Mobile Instant Photo Printer for $49. Features: Mini Smartphone Printer Lets You Print 2.1 X 3.4” Photos Direct From Android or iOS Device; No Cables or Buttons Necessary. NFC One Touch for Android Launches Kodak App to Print in Seconds; Also Compatible With iOS/Android Via Bluetooth. Innovative 4 PASS D2T2 Dye Transfer Method Produces Beautiful, Detailed Black/White or Color Portraits That Dry Instantly & Stay Bright Up to 10 Yrs. innovative Kodak MC Cartridges Combine Paper & Color Ink for Easy Maintenance; Purchase Refills in Increments of 20, 30 or 50. Download the Kodak Photo Printer App for Filters, Cropping, Stickers, Card Templates, ID Photo Print, Video & SNS Print & More.